EasyOffice uses the CREDIT as value for the services corresponding € 0.10 (+VAT), the conversion is done automatically while charging. Sending a single FAX page costs di 0,10 € (+VAT) = 1 credit (except promotions). 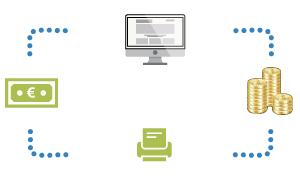 The service Mail2Fax has no additional costs compared to what you would pay with the single sending of a FAX. The geographic number for receiving FAX (FAX2MAIL) is included within the subscription monthly or yearly of Easy Plan Basic or Easy Plan Plus. * * Prices are inclusive of Italian VAT (22%). ** Monthly SMS and FAX are not cumulated with those of the following month. Every SMS with 160 characters costs 0,10 € (+VAT) = 1 credit (except promotions). The service Mail2SMS has no additional costs compared to what you would pay with the single sending of an SMS. No sore, EasyOffice informs you about the expenditure for each service with full transparency. After making a charge, you can use the full amount for the services. No activation fee, no obligation to renew the subscription services, no monthly fees, no cost to recharge the credit. Recharging can be done directly from the Personal Area both for the account used for the services. Recharging Credit is expendable for all services. The charging service, without cuts nor minimum preset refills, supports major credit cards, bank transfer and PayPal.